Former President Barack Obama speaks to students at the University of Illinois, where he accepted the Paul H. Douglas Award for Ethics in Government on Friday in Urbana. "It did not start with Donald Trump. He is a symptom, not a cause," Obama told students at the University of Illinois at Urbana-Champaign. "He's just capitalizing on resentments that politicians have been fanning for years — a fear and anger that's rooted in our past, but also born out of the enormous upheavals that have taken place in your brief lifetimes." The former president, who was accepting an ethics award from the school, said voting in this year's midterm elections was the antidote to stopping the fear and division that Trump has stoked. "Our democracy depends upon it," he said. "This moment really is different. The stakes really are higher. The consequences of any of us sitting on the sidelines are more dire." America, Obama argued, has been through similar trials before — two steps forward in progress followed by a step back, with ebbs and flows throughout history. But now, the country is at a crossroads, he said, and the "indifference" and "cynicism" that leads to not voting could be dire. "If you don't like what's going on right now — and you shouldn't — do not complain. Don't hashtag. Don't get anxious. Don't retreat, don't binge on whatever it is you're bingeing on. Don't lose yourself in ironic detachment. Don't put your head in the sand. Don't boo — vote," Obama said, kicking off a midterm push to encourage especially low-propensity voters — like the college students he was speaking to — to go to the polls. The speech, which lasted more than an hour, was among Obama's first major forays back into the political arena. The stakes are high for Democrats, who have a chance at flipping the House and a longer shot at even taking back the Senate in November. They've already been buoyed by signs of enthusiasm in special elections and primaries so far. But Obama underscored they could take nothing for granted. The former president also wasn't subtle in his criticism — and often incredulity — at Trump and some of his actions since taking office. "Appealing to tribe, appealing to fear, pitting one group against another, telling people that order and security would be restored if it weren't for those who don't look like us, or don't sound like us, or don't pray like we do — that is an old playbook, as old as time," Obama said. And while these students' "generation is the most diverse in history," he said, economic conditions and more have made such division "ripe for exploitation." "Even if you don't agree with me or Democrats on policy ... I'm here to tell you that you should still be concerned and should still want to see a restoration of honesty and decency and lawfulness in our government," he said. "We are Americans — we're supposed to stand up to bullies, not follow them. And we're sure as heck supposed to stand up to Nazi sympathizers," Obama said, referring to Trump's comment that there was blame on "both sides" at a white nationalist rally last year in Charlottesville, Va.
That kind of equivocation, Obama argued, isn't one that has its roots in the Republican Party, referring back to one of his favorite presidents and fellow Illinois son, Abraham Lincoln. Obama made the case that the current GOP has become complicit, turning a blind eye to racist dog whistles and to what has transpired in the Trump White House. 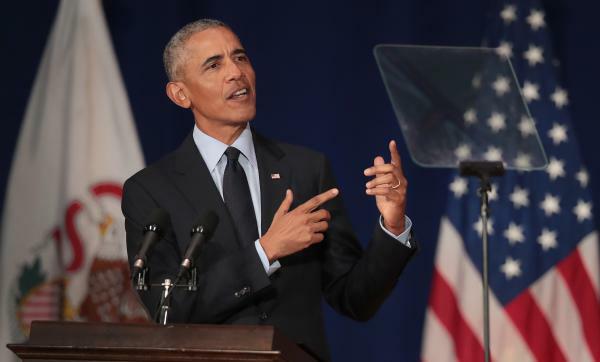 "Over the past few decades, the politics of division and resentment and paranoia has unfortunately found a home in the Republican Party," Obama said, pointing to conspiracy theories that Trump and others have stoked, including false "birther" allegations that Obama wasn't born in the U.S.
And in accepting Trump, Obama said, Republicans have abandoned many of their long-held guiding principles, like forgoing lower deficits in favor of tax cuts and maintaining a hard line with Russia. "[The GOP's] central organizing principles in foreign policy was the fight against communism, and now they're cozying up to the former head of the KGB? What happened?" Obama asked. Most Republicans, he said, have been silent or "unwilling to find their backbone" to stand up to Trump. And while some within the administration have come forward — albeit anonymously — this week to sound alarm bells over what they consider to be Trump's unfitness for office, both in an unsigned op-ed in The New York Times and a forthcoming book from journalist Bob Woodward, those actions aren't enough, Obama argued. Both pieces describe officials working behind the scenes to undermine some of the president's requests. "That's not how our democracy's supposed to work. These people aren't elected. They're not accountable. They're not doing us a service by actively promoting 90 percent of the crazy stuff that's coming out of this White House and then saying, 'Don't worry we're preventing the other 10 percent.' That's not how things are supposed to work. This is not normal," Obama said. "These are extraordinary times. They're dangerous times. But here's the good news: In two months we have the chance — not the certainty, but the chance — to return some semblance of sanity to our politics," the former president continued. "Because there is actually only one real check on bad policies and abuses of power. And that's you — you and your vote." Trump, for his part, joked just an hour later during a fundraiser in North Dakota that he found Obama's speech boring. "I watched it, but I fell asleep," Trump said. "I found he is very good, very good for sleeping." Separately, Trump also told reporters on Friday that Attorney General Jeff Sessions should investigate the Times column, calling it a "disgrace."